next April 7, 2015 2:33 p.m.
Not that that’s stopping the people creating these monster screens. Apple, for instance, is planning to release an iMac with an 8K screen, according to a surprising LG press release. The announcement, uncovered by Appleinsider, included this tidbit: “Apple has also announced that they will release the 'iMac 8K' with a super-high resolution display this year.” Except Apple hasn’t announced that at all. But, since LG manufactures Apple’s 5K iMac, there's every reason to believe it's true. Plus, Apple and its competitors have become obsessed with cramming pixels into their products. The advantage of these higher-resolution displays, according to proponents, is a clearer picture, with deeper color saturation and a more immersive experience. This is achieved with more pixels. All TVs have a native display — a number of pixels they’re designed to show off. The HDTV you’ve probably got at home is 1,920 pixels wide and 1,080 pixels tall. A 4K TV doubles both of those numbers, resulting in a display with 8 million. It’s not hard to imagine how that would make for a better picture. Same for an 8K display, which would bump the pixel count to 7,680 x 4,320. Companies like Apple are betting that by beefing up these numbers they can sell their customers on buying ever more powerful displays. This is a race toward phones with 4K screens, TVs with 8K displays, and gaming rigs with 12K setups. As screens get bigger, differences do become observable, though, which is why 4K TVs have won many adherents, despite the lack of content that takes advantage of their capabilities. Today, there are some streaming and downloadable options, and 4K Blu-ray discs are expected to arrive later this year. But most of the what people watch on their 4K TVs is HD content upscaled to 4K. And that doesn’t always look great. And once 4K is as ubiquitous as HD, companies have another step up to sell — the wonders of 8K. LG announced its 98-inch version at CES in January and it was, as Gizmodo put it, “absolutely insane.” It’s also years away from being a real option and even more difficult for the human eye to really appreciate. 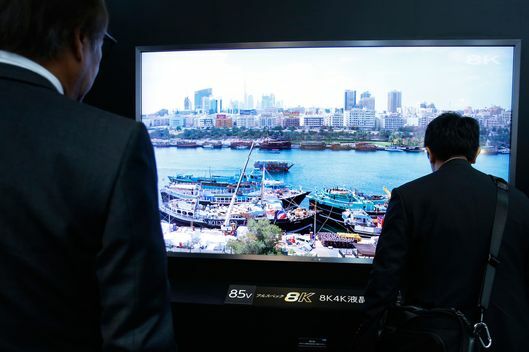 LG might claim that “the world is turning to 8K," but that's more marketing than anything else. And 12K? So far, that’s been left to ambitious tinkerers. But give the tech companies time. They’ll be there soon.